Red fabric is the perfect way to add a punch to your quilts! From a mix of scrappy prints to solid reds, these quilts will stand out in any home. The classic red-and-white combo and traditional-with-a-twist star blocks make the quilt a winner year-round. Flying Geese soar in crisscross formations on this red-and-white delight. Whip up a red-and-white table mat using six fat quarters. Fifty-six red-and-white blocks create intersecting light and dark “dots” in this throw. A polka dot border ties them together. Strips from red-and-white prints and a little clever cutting make this throw look like a candy cane. Two white prints form zigzag paths against a backdrop of red florals for a beautiful wall quilt. Create a dramatic, global-inspired table runner from a mix of red and cream paisley and geometric prints. Frame star blocks with a scrappy accordion border and a standout red paisley print. Combine simple designs and classic red-and-cream prints for an endearing cozy pillow. Compose this fresh red-and-white wall hanging with various cheerful prints and a simple Churn Dash block. Flying geese and hourglass units in 24 red hues ranging from tomato to burgundy pair with 16 light prints for an ultrascrappy take on the classic two-color quilt. 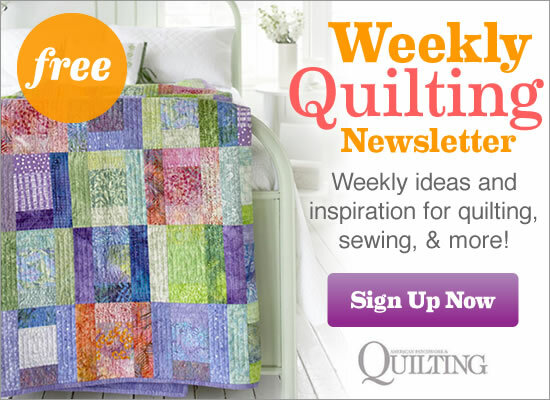 Make a bed quilt quickly to show off eye-catching reds and two sizes of triangle-squares. A variety of scrappy reds are the perfect combination for nine-patches and triangle-squares in this tabletop quilt. Surround red and white strips separated by sashing with a pair of borders in an easy kid’s quilt that any gender will love. Choose a red print for a border and pair it with desert-inspired prints in traditional yellows and blues for a wall hanging with a Southwestern look. Red-and-cream prints create an elegant pillow when combined with buttons. Turn red prints into an elegant quilt by pairing them with a simple color palette of black and white. In this wall hanging a toile print takes center stage among subtle overall prints. Red-and-white patchwork provides crisp, clean frames for redwork stitchery in this delightful crib quilt. Use romantic florals, stripes, and prints that all feature red for a cohesive, but interesting, wall hanging. Pair scrappy reds with blues for a standout throw of tumbling triangles.